Trump Blames Dems For "National Emergy" Of Migrant Caravan, Claims "Middle Easterners Are Mixed In" - Joe.My.God. President Trump said Monday that the Democrats are to blame for the caravan of several thousand migrants that’s making its way through Mexico to the southern U.S. border. More than 7,000 migrants broke through Mexico’s southern border and continued on their trek to the United States. 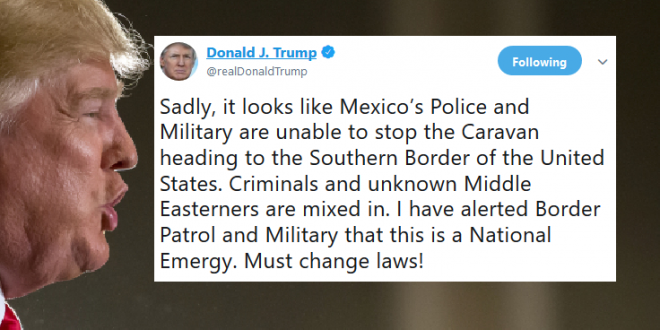 Trump said he told the military and U.S. Border Patrol that the caravan headed to the U.S.-Mexican border is now a national emergency.